Every detail of Olivia Song’s family-friendly Brooklyn brownstone is meticulously considered. In her 15 years as a sought-after designer and project consultant in both hospitality and residential design, Olivia understands how flow and feeling can enliven and elevate a space. With the exception of minimalism, she’s always been drawn to the vibrancy of many different interior aesthetics—when displayed in the right context. She remembers how, even as a child, she never put anything away. 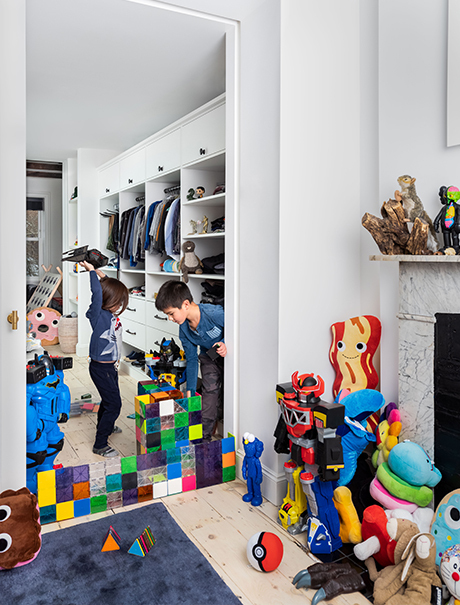 For her own home, Olivia called on California Closets New York’s Carolyn Musher to help her create order and a sense of calm by ensuring she and her family could live comfortably amongst all the things they love and need. I've known my designer, Carolyn, for over 10 years. 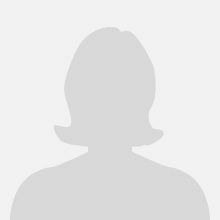 She has the ability to make perfect recommendations and quickly draw up plans based on my nebulous descriptions… I completely trust her. Olivia worked closely with Carolyn on custom storage solutions for the master closet Olivia shares with her husband, as well as her sons’ closet. While the two spaces are large and open relative to most city closets, Olivia envisioned simple, built-in systems without doors or fuss to slow family members trafficking through, or block access to other immediately adjacent rooms. For the master closet, it was less about ‘pretty’ and more about utility for Olivia. 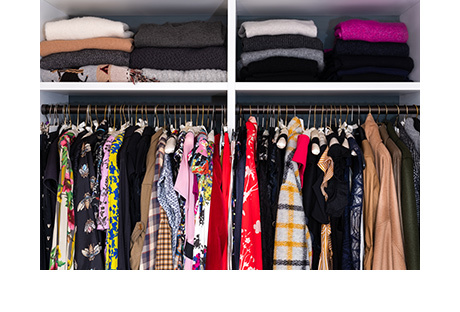 To create a division of space, Carolyn gave Olivia’s husband his own dedicated wall (his wish) so that the Olivia's wardrobe wouldn't spread throughout the entire closet. It was important to Olivia to have all her daily wears—workout gear, sweaters, jeans, etc.— at eye level and up high! Height drove key design decisions for the tall couple who prefer to avoid bending over to access their belongings. For a personal touch, Olivia also opted for made-to-order, oil-rubbed bronze hardware to enhance the bespoke look. Conversely, Carolyn collaborated with Olivia to ensure a bottom-heavy design for the kids' closet, giving her boys easy access to everyday items like superhero underpants and tees. I know people love to see their beautiful shoes on display, but my occasions for 105mm floral satin stilettos are limited. Looking around my closet, I'm surprised my friends accuse me of wearing mostly black. Clearly, I never met a plaid or floral I didn't like. This is why I need more California Closets in my life. At a macro level, it's a start to having a proper place for things. Simple yet smart, the redesigned spaces provide Olivia and her family with functionality that makes their everyday that much happier and more efficient.